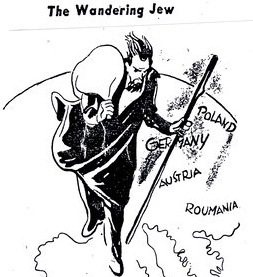 German Jewish refugee artist Eric Godal (1899-1969) drew political cartoons for various American publications in the 1930s and 1940s, often focusing on the plight of Jews under the Nazis. Born Erich Goldman in Berlin, Godal found himself on the Gestapo’s list of “dangerous” citizens as soon as the Nazis rose to power, because they considered his occasionally provocative artwork to be “degenerate.” Narrowly escaping arrest, Godal fled to Czechoslovakia in February 1933 and then made his way to the United States, where he became a political cartoonist for Ken magazine, the New York City newspaper PM, and other publications. Godal’s mother, 64 year-old Anna Marien-Goldbaum, a widow, remained behind in Germany. Finally, in 1939, an opportunity arose for Mrs. Goldbaum to be reunited with her son. She secured a visa to live temporarily in Cuba, as well as a place on a waiting list to be admitted to the United States. The ship on which she sailed, the St. Louis, was turned away from Cuba and then hovered for three days off the coast of Florida, hoping to be granted haven by President Franklin Roosevelt. “It is so strange how near, and yet how much cut off we really are,” Mrs. Goldbaum wrote in one of the letters. “I feel that you are backing me from far away, and that gives me courage to go on.” In the second letter, too, she tried to put on a brave face: “I still have the hope that President Roosevelt and other influential people will help us…I shall not lose courage until the happy end is reached.” On the day Mrs. Goldbaum’s letters appeared in the newspaper, the St. Louis, denied permission to land in America, began heading back to Europe. The governments of England, France, Holland, and Belgium each agreed to temporarily admit a portion of the passengers. Mrs. Goldbaum was among those admitted to Belgium. Less than a year later, however, the Germans occupied Belgium. Close to half of the country’s Jewish residents, including Godal’s mother, were deported to Auschwitz and other Nazi death camps. 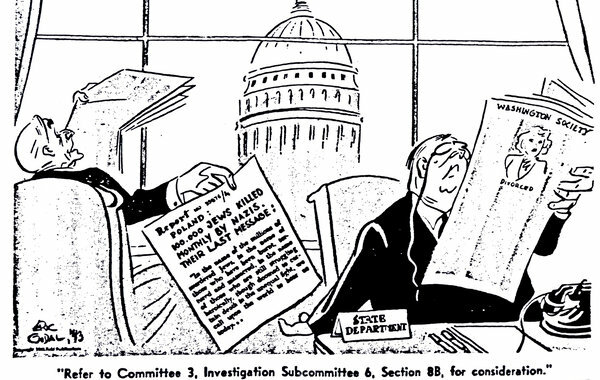 In October 1943, Godal drew the most explicitly critical cartoon about the Roosevelt administration’s policy toward European Jewry to ever appear in an American newspaper. Published in PM, it depicted two State Department bureaucrats callously ignoring a report about the murder of 100,000 Polish Jews daily. Ogilvie and Miller, Refuge Denied, p.198.